today I like to give you a first impression on a new book of my friend Tom Durante. 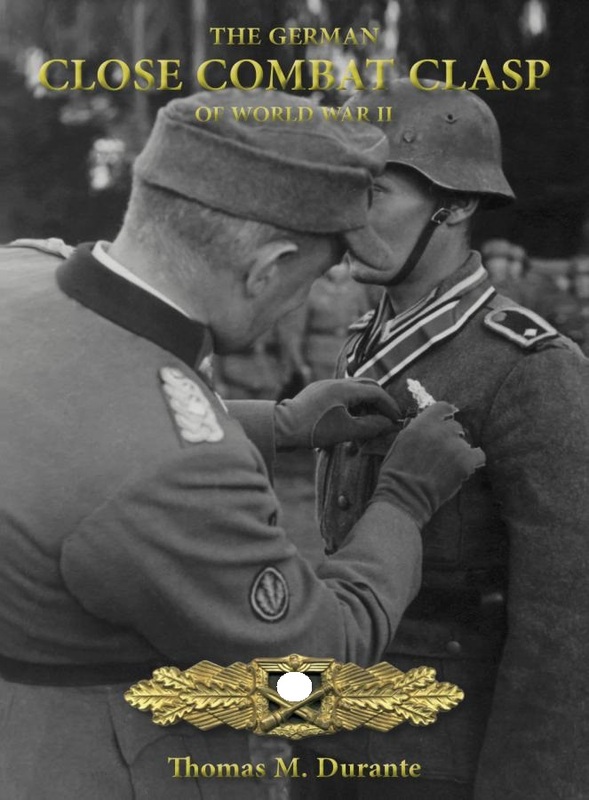 I am happy to announce my new book on the Close Combat Clasp. This is the 2nd edition to the first printing more than 11 years ago. I have gotten a lot of requests over the years to do a 2nd printing and I took the opportunity to add in as many variants of the clasp I could put my hands on and am happy to say that this book will not disappoint! 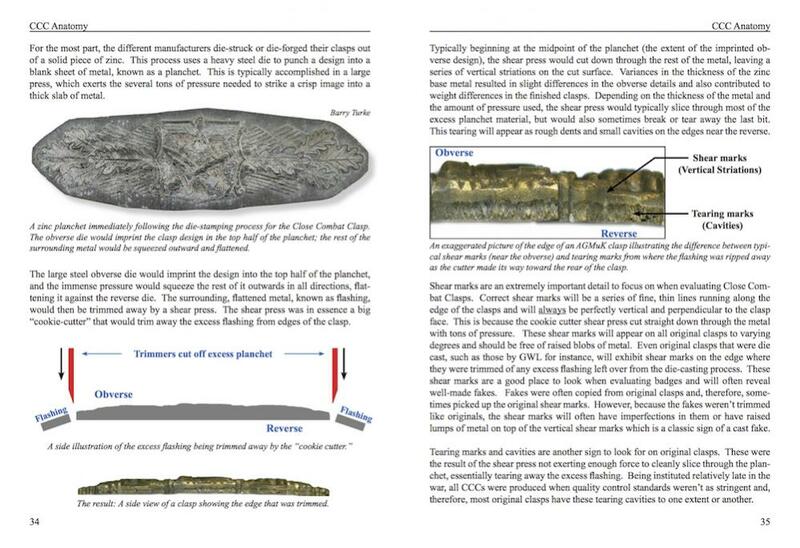 It is a complete book on the Close Combat Clasp, including every individual clasp maker and all their variants. 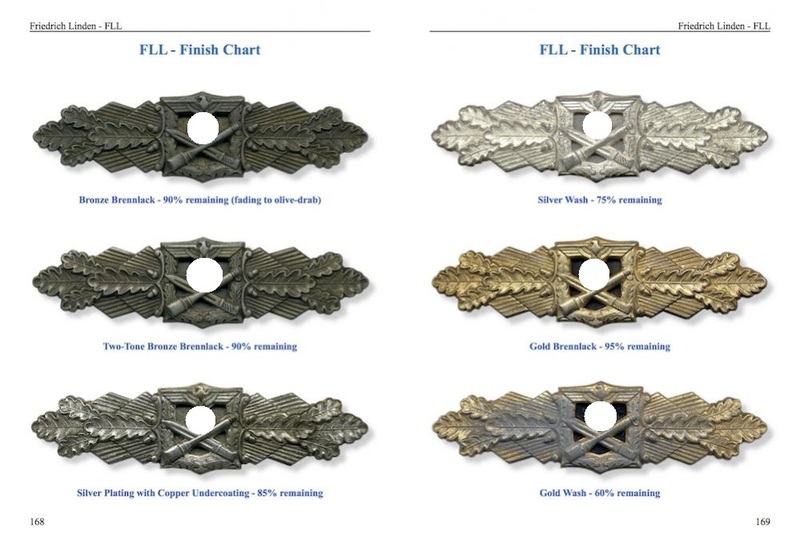 No unique die characteristic or reverse hardware setup change was too small; each has been categorized and examined in great detail along with an explanation of what sets that variant apart from other clasps. 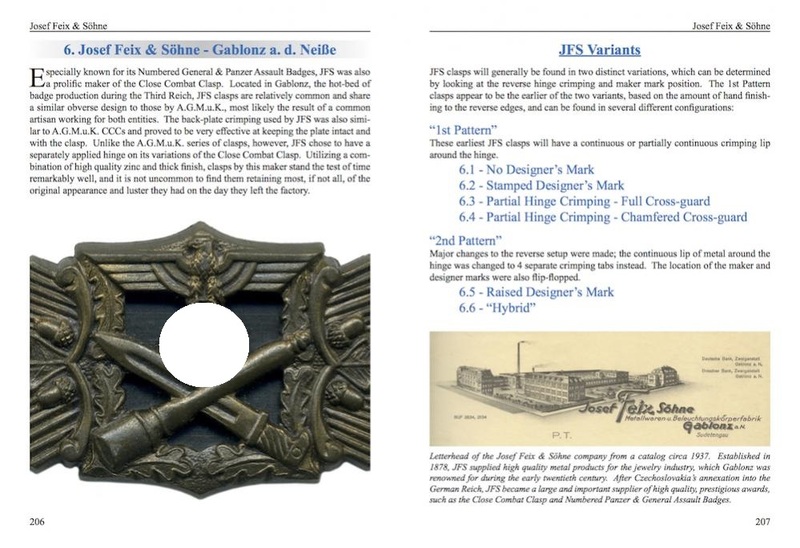 I have also added several „Quick Reference Charts“ to all chapters for quick and easy identification of each maker and each clasp variant. 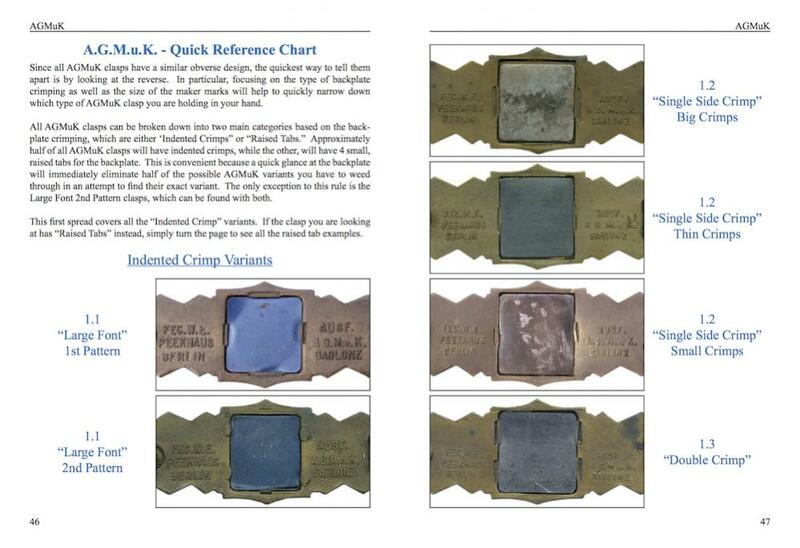 This will be a big help in sorting out the many variations of AGMuK clasps, among others. My first book was 309 pages, this 2nd edition is 464. It includes all the information from the first book, along with all the additional variants. 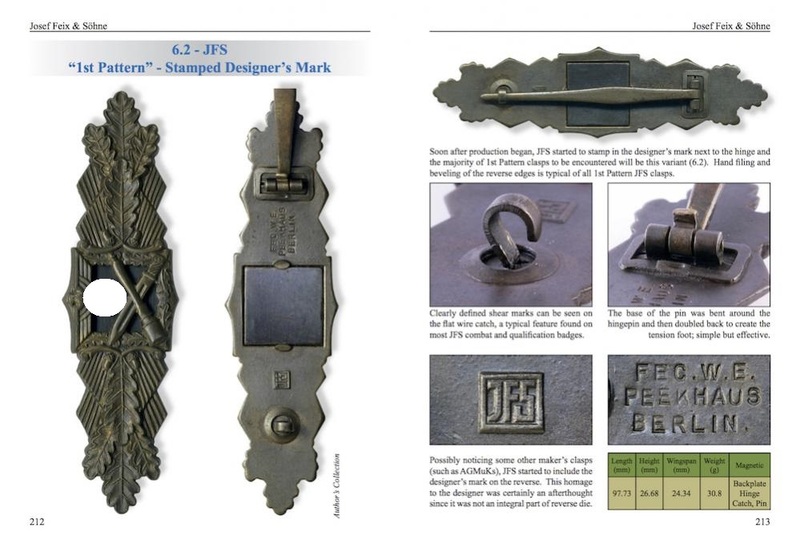 A large chapter on the Golden Presentation Close Combat Clasp is included, with several examples of each pattern being shown, along with their respective cases. 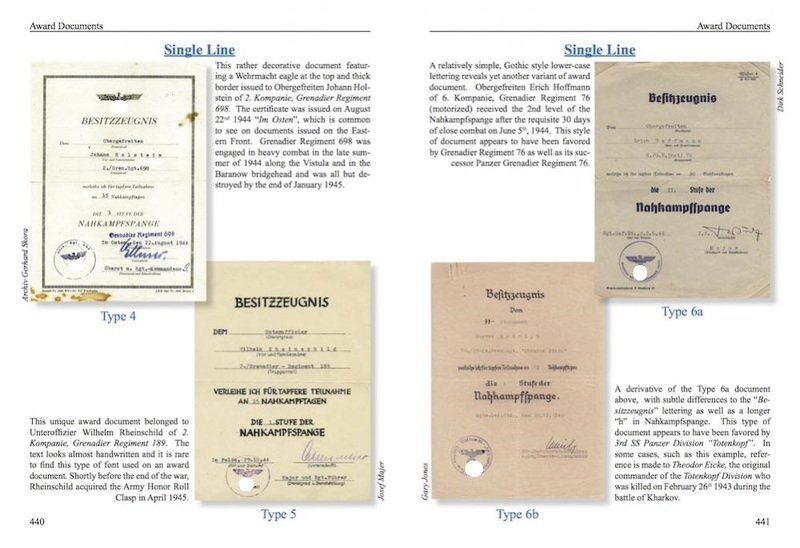 There are many nice groupings in the book, but also Award Documents have been broken out separately and given their own chapter which will make them easier to identify and search. And last but not least, a full chapter on all the most recent and dangerous fakes on the market. 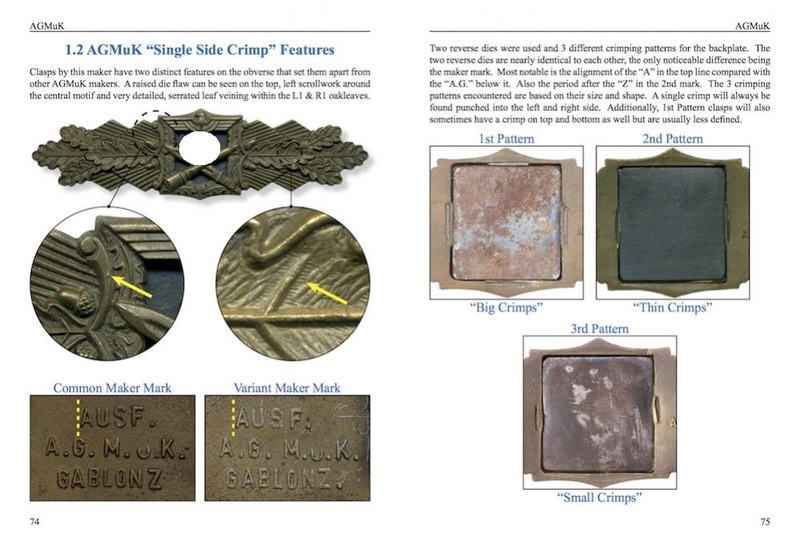 More than 11 years have passed since the first printing and unfortunately the fakes have gotten better and harder to detect so I feel a dedicated chapter on the best reproductions to date is an important aspect to any collector book. Over 460 pages and 1,350 high quality, color images in 7″ x 9.5″ format. The books are currently being printed and are scheduled to be done and shipped from the printer to me on January 18th. Book price will be $159 + S&H. The first 100 will Limited Edition, serial numbered and signed by me, and I will offer those at $179 + S&H. I am offering a 10% discount for any orders that come in before January 18th. And all contributors to the book will also get a 10% discount for their kind and generous assistance. Please email me at tmdurante@gmail.com if interested. Thanks guys, I know you guys will be very happy with this book. 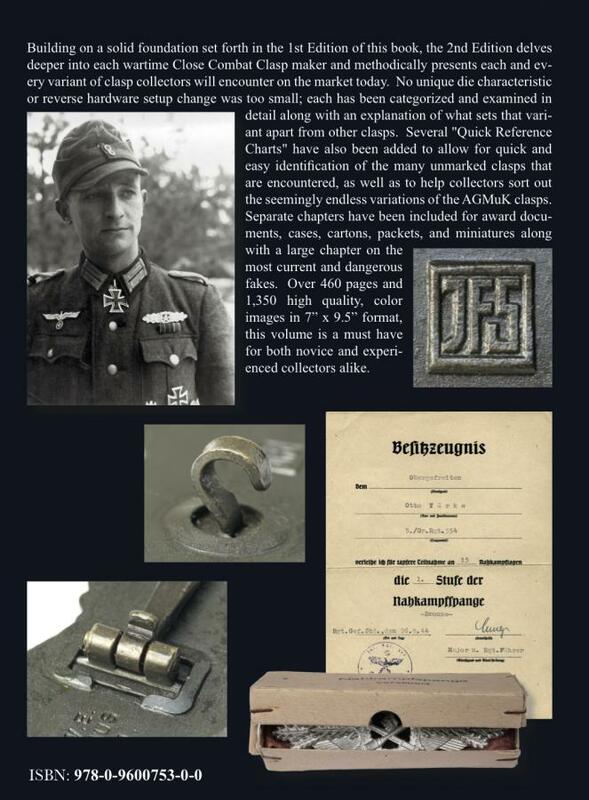 This book on the four cuff titles of the German Wehrmacht is a helpful hand for the collectors of battle badges and decorations to identify the desired piece as an original cuff title and finally to bring a nice addition to his own collection. In this work only the known cuff band types are presented, which have been classified on the original collector’s market as 100%. All pieces are shown in their details using large-format color photos. 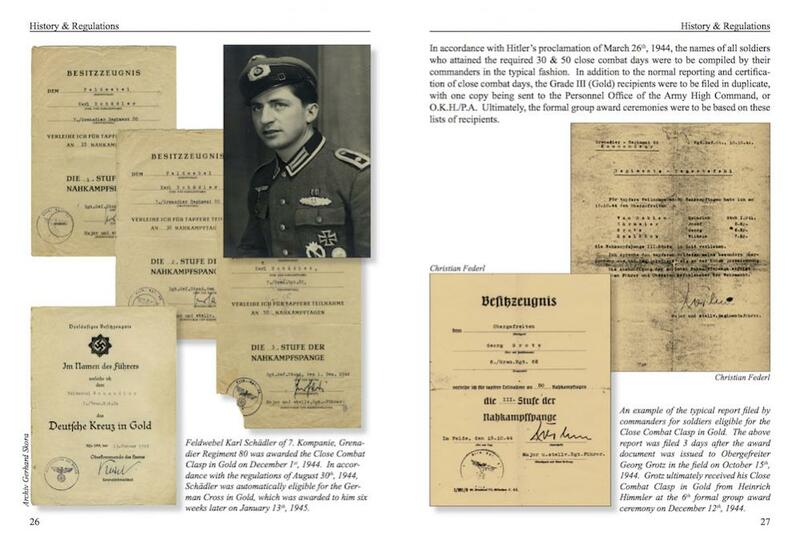 Some historical pictures of bearers and images of documents complete the representation. after a busy weekend with the first auction of our new project „Auktionshaus Hanseart “and the whole week of the Kassel Show November 2018, it is time for me to bring my ship in calm waters. But let’s start at the beginning. This year my schedule for the week 27th of November until 2nd of December was really packed. Not because of my hobby….more because of the political poker in Europe and the position of the armed forces. Anyway, somehow I managed it to get a few days of duty to attend the Kassel fair. 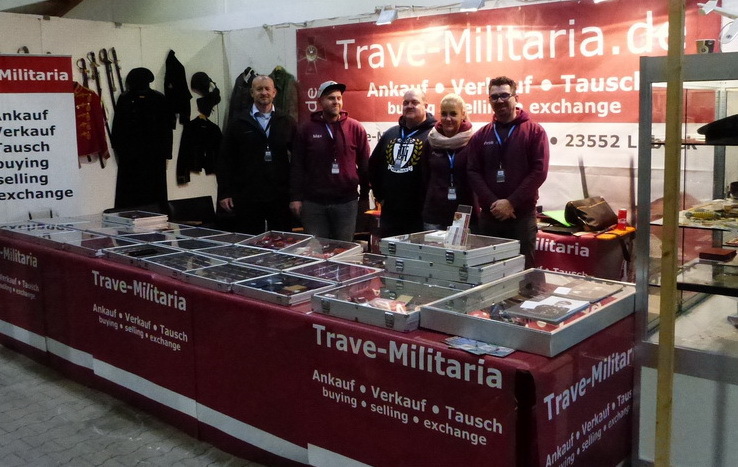 The whole Team around Dennis Suitner from Trave Militaria left on Tuesday morning for Kassel with all the stuff you need for a good Kassel Show (coffee and candy’s). So they started to build up their sales corner at I-4 in the Hall number 1. 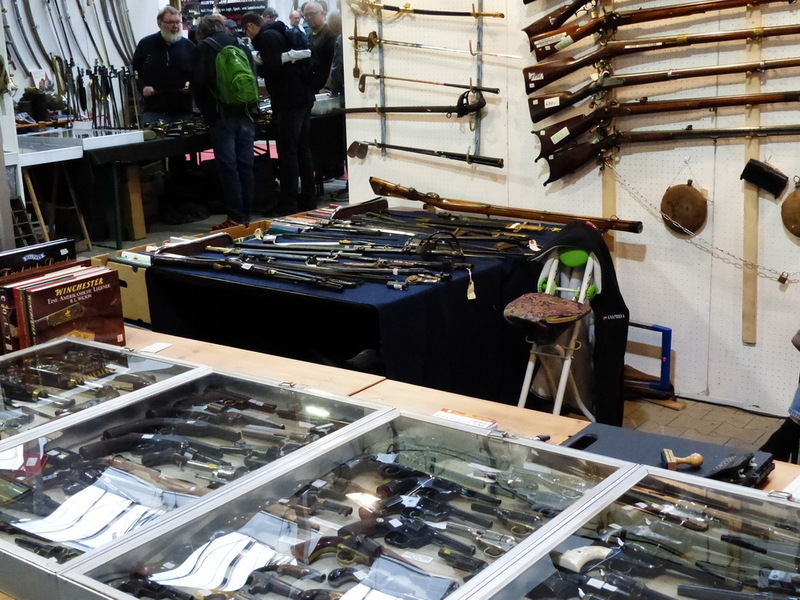 Some dealers were already there and as usual there were some deals made and some nice groupings changed the owner. They gave me a cell phone “Heads up” on Tuesday evening, so I knew what to expect on Wednesday morning. It took me about a 5 hours’ drive to Kassel and I arrived at 11:00 o`clock on Wednesday at the parking lot. Well, you can’t get inside without a dealer`s card, so Peggy came outside, brought me my card and I went inside. On the way to our corner I met a few dealers and it was really great to see that so much people were happy to see me 😉 (or they were just afraid and tried to “smile” that away). In our sales both I met Dennis (the Boss of Trave Militaria), Christian (first man for Medals and badges, Specialist for paperwork’s) Max (second man for Medals and badges, Specialist for Kriegsmarine Awards) and Peggy our sweetie who does the paperwork, tells us how to do things and takes care that we got enough calories to survive the day. After checking all the stuff we have for sale I did some talking with the boys and shortly after a lot of customers attacked our tables. 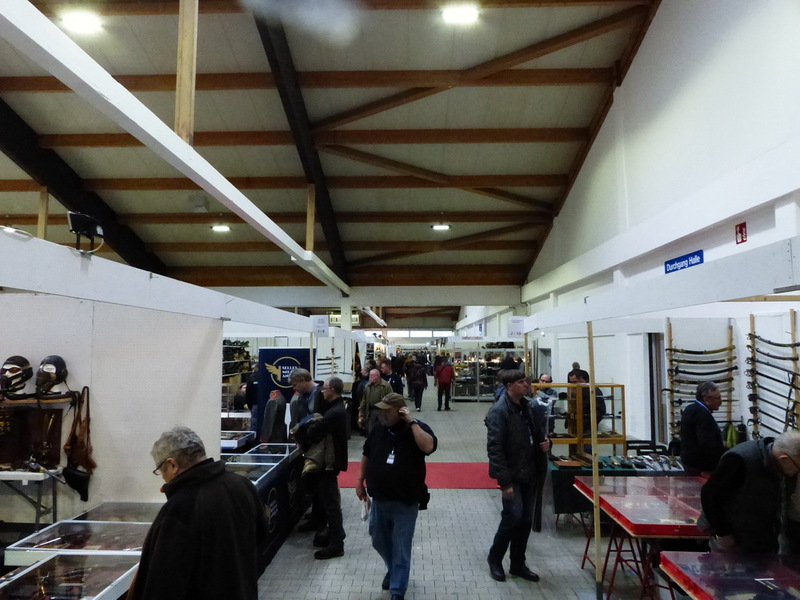 In the afternoon a lot of collectors came to see me. I was so happy to meet some guys first time in person. You have to understand that, because of my old company emeredato, my work in different online forums and my blog, I have contact all over the world via email. But to meet somebody in Person is not an easy task because of the distance. A pleasure to meet Malcolm, Grzegorz and Jon first time and we had a really good talk about collecting medals. 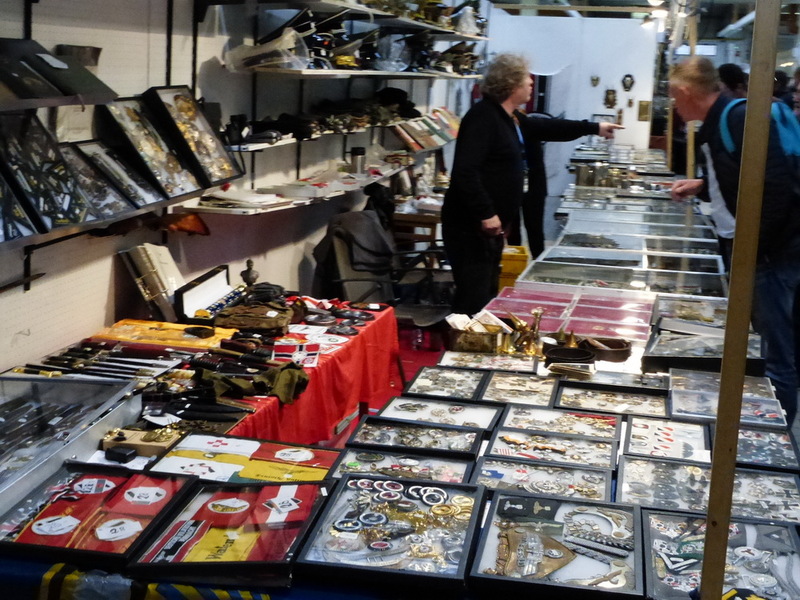 On Wednesday were a lot of dealers and collectors in the area. 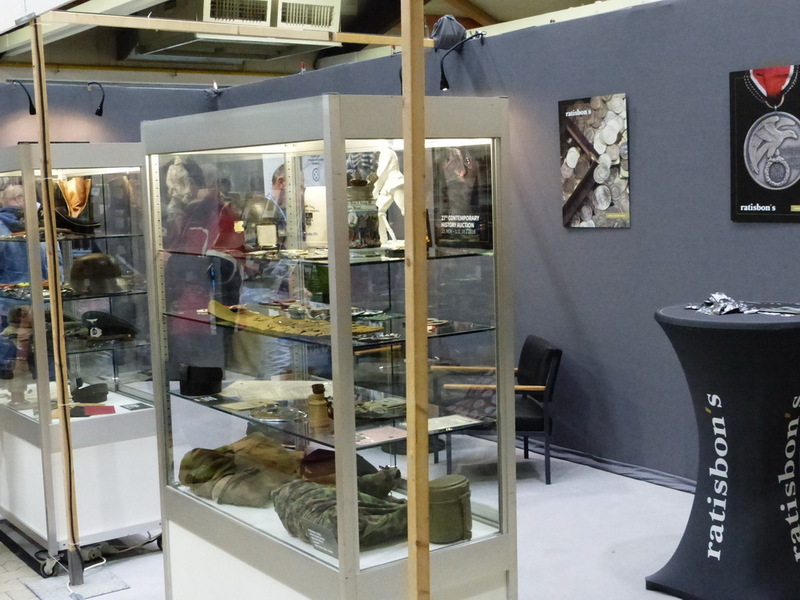 Philippe de Bock (German Combat Awards) and Giel Van Wassenhove (Giels Militaria) stopped by for a chit chat, Christan von Eicke (Militaria Berlin) and Frank Scholz (Militaria Scholz) had some interesting new from the collector’s scene. 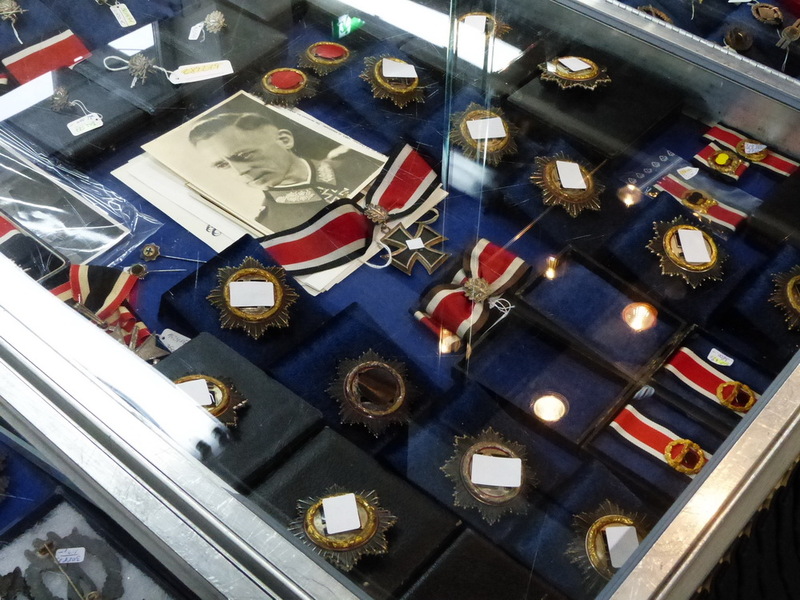 Mr. Thomas Huss was also there and he had some nice Kriegsmarine awards on his table. Mr. Helmut Weitze took some time and we talked about the German Navy (he is a former navy sailor) and we also talked about some development in the collector’s world. 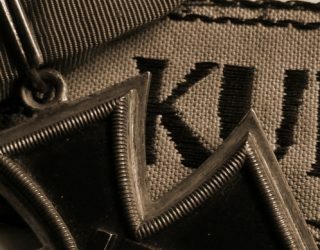 Collecting is always learning, so I changed some interesting facts about combat awards with Mr. Andreas Dorn from the Weitze Team. 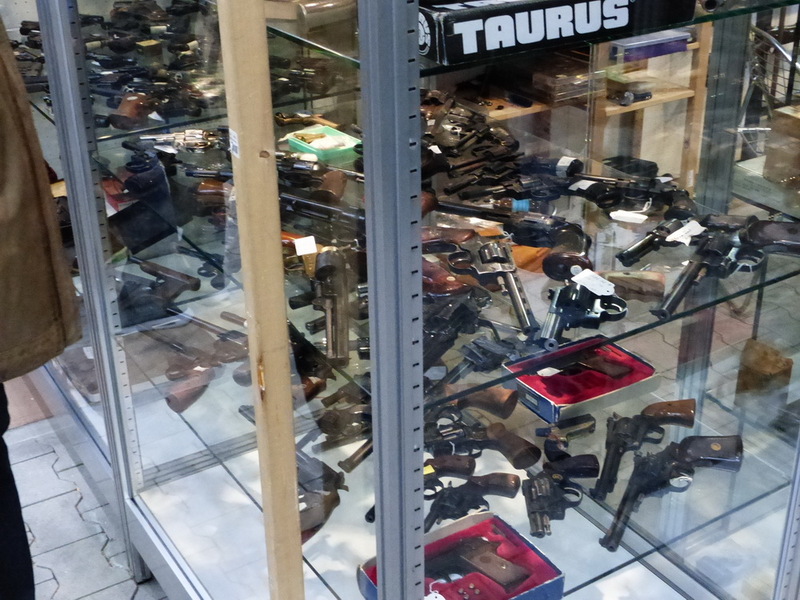 It was about my time to sneak around the other dealer`s tables. Sadly I found a lot of high end fakes on different tables. 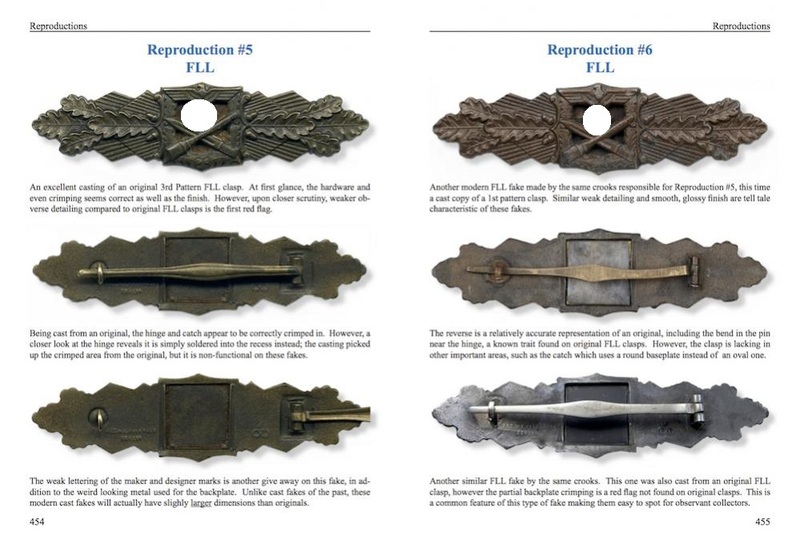 I checked for Cholm Shields and Lorient Shields and what can I say….. 80% were fakes…..So I switched to cuff titles….at least 50 % were fakes. That was not good to see. But what scared me the most was another thing. I am not really in Uniforms, but a good friend of mine collects them for 25 years. 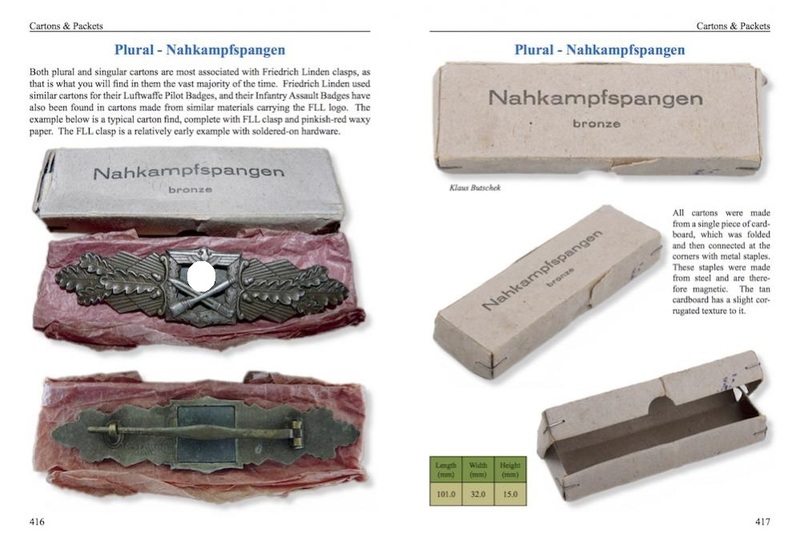 He got only one good SS Tunic in all the years and only one Panzer Wrapper without any insignia….in 25 years running around fleamarkets, checking antic stores, advertising in the newspaper……And here on the fair I found 20 Panzer Wrappers and about 100 SS Tunics……no comment. Finally I found nice badges from the Army and Navy, good and rare Luftwaffen badges in nice cases and some good Knights Crosses and German Crosses. Prices were high but almost everywhere was a chance to talk it down a little bit. All the collectors who stopped by showed me their “prey” and some of them made a pretty good deal. About 18:00 O´clock we headed to the Hotel for a nice dinner and later on some beer in the hotel bar. 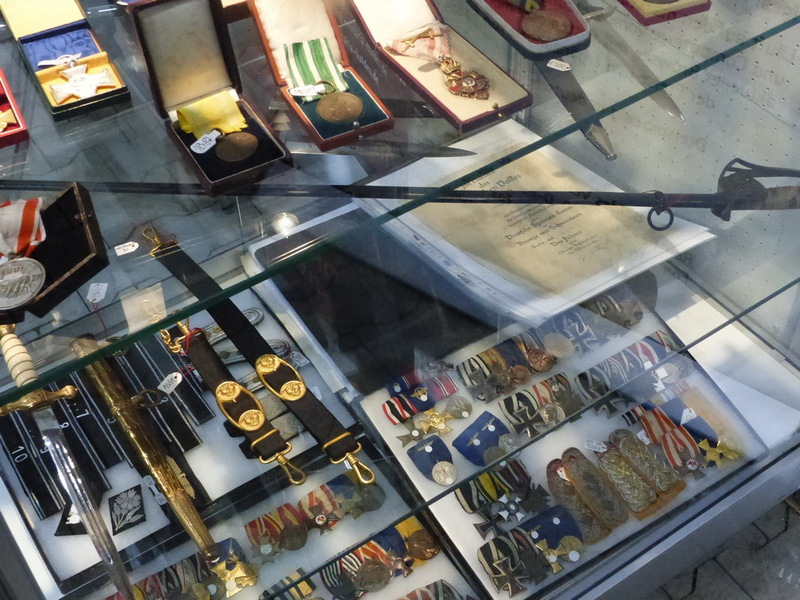 Next morning, we were ready to take care of all the collectors who wanted the best medals and badges for the best prices. Again no much time for me to go around to see the other guys. But I got a few minutes and I met Andreas and Michael from Ratisbon and also the guys of Hermann Historica. 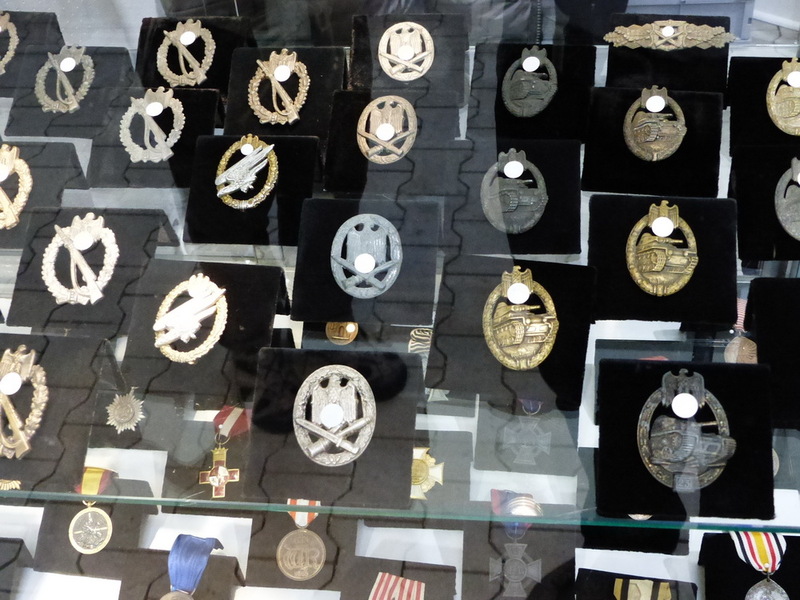 I checked the area of Mr. Carsten Baldes (Baldes Militaria) and found a lot of nice Luftwaffe Badges. Mr. Thies had his presentation corner with really nice WW1 and WW 2 items on display. 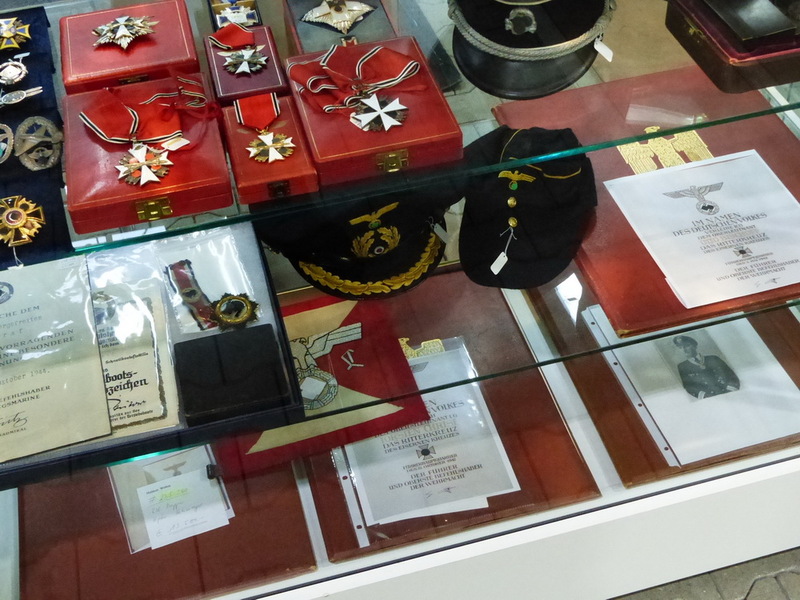 I found myself more than once close to Helmut Weitze`s badges area to have a close look on ultra-rare badges, cuff titles and even Knight’s Cross Maps. Always good to see it live and that way you learn a little bit every day. That day, collectors from all over the world stopped by and met me at our sales corner. From Italy, Poland, Russia, Sweden, Abu Dhabi, France, Austria, Denmark and so on. Short but good talks, kind words for my “blog work” and some guys brought nice stuff to look it over. Lot of guys from the MFF (special helmet collectors) and from other collecting areas. Time flew by and later that day we headed back to our Hotel. Getting older you need more time to load your battery, so after some long drinks with Dennis, Christian, Max and Peggy I went to bed early. For Friday we expected not so much collectors, but a big wave came towards us and we had a lot of work with buying and selling. The Guys from the You Tube Channel “WarStory.ru”, Alex and Ivan asked me if they can do an Interview with me. So they interviewed my about medals and badges and also some facts about the collector’s scene. I was a little bit nervous so if I said something wrong about the production time frame in which Otto Schickle produced medals and badges……forgive me that and let me live ;-). Maybe they changed it but if not……I let you know as soon as the interview is online. Frankie, Gerd and Karl came to us with nice awards. Really funny with them and they wanted to hit the Hotel Bar with us that night. It was a sad thing for me that I had to go home that day. But that´s my job and if the navy calls, I got to go. So I said goodbye to all the dealers and collector friends and drove home. Again 5 hours and Friday night around midnight I was home. 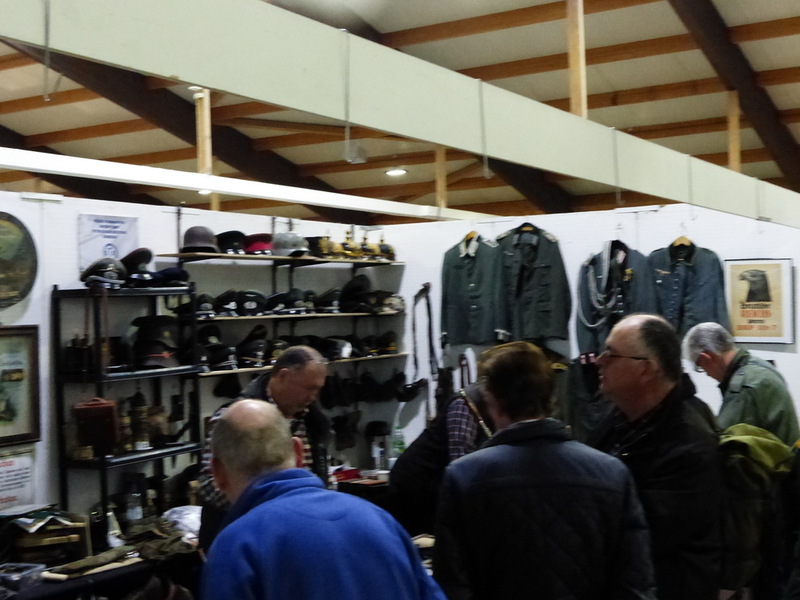 Bottom line: One of the best Kassel Fairs in years, good talks, good medals and badges, good information’s on the military scene and some good meetings with friends.